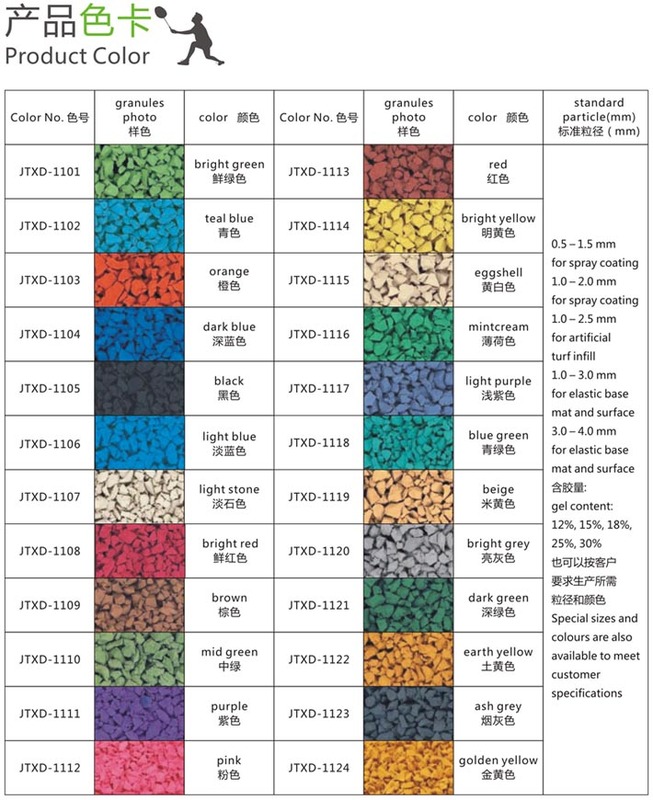 Welcome to visite Brothersports website:We supply Plastic runway particles,EPDM granules,TPE granules. High quality, fine material, non-toxic and inexpensive. For more available styles or any other inquiry, pls contact us now! Size:: 1-2.5mm, 1-3mm, 2-4mm, 1-3.5mm etc. 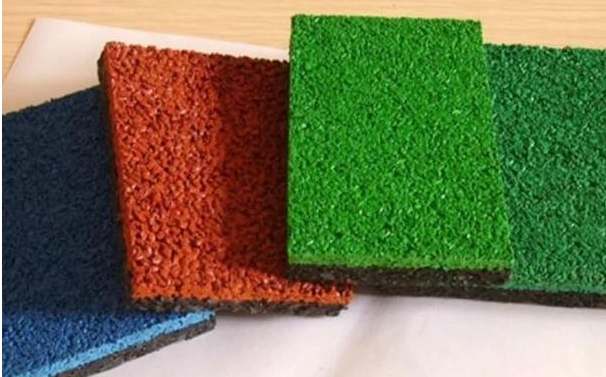 Jintan Brother sports products co.,ltd can offer a wide variety of EPDM color products, for a vast number of applications. Racetracks, fitness room, health care centers, dancing room, parks, balconies, patios, corridors of office buildings, high-class hotels, overpasses, sidewalks ect. EPDM granules provide a durable, cohesive, non-toxic and environmentally friendly track surface which meet the rigorous athletic standards set by the International Amateur Athletic Federation (IAAF). Heavy metals such as lead and mercury, have been a component of many track systems. Today, schools are making the switch to running tracks that are free of heavy metal hazards. The Poly-Resin technology employed has no need for heavy metal components. Tests indicate the safety of the products that they are not any mercury or lead hazard. daily cleaningwashoutside, no specialmaintenancewithin a reasonablerange. 3 Elasticity With tempered elasticity andrebound, reduce physicalconsumption and enhancecompetition results. 4 Shockabsorption Adaptthe footto absorbshock, reduce injuries, suitable for long-termtrainingandcompetition. 5 Weatherability Notdue toultraviolet light/ozone/acid rain/pollutionarefading,chalkingorsoften,andmaintain keep long-termbrightcolors. 6 Wear Not because ofprolongeduse of highfrequencymotioncaused bysurfacedamage. Track and fieldequipment,the weightwill notand can'trestore elasticity. 8 Skid resistance Whether in a humid environment or in bad weather, make your feet steadfast, and not attain affect you slip during exercise. 10 Impact resistance Provide a toughelastic layerandthe buffer layer, can absorbstrong impact, andthe surfacewill not bedamaged. 11 Flatness Useself-levelingconstructionmaterial, flat surface,can meet thespecialrequirements ofa flatplaying field. 12 Adhesiveness Able todeal withspecialconstruction, strong bonding,cansuppressthe rise, no blistering,peelingand other phenomena. 13 Colorful Surface colorshould besoft,venuegranulesloadingsurfacematerials,should be able topreventglarereflection, beautiful and durable.